On the surface, McCanick is a simple story of a cop going after an ex-con who he has a history with. As the film progresses, the lines begin to blur, leaving the audience to question who is really the good guy and who is actually the bad guy? This film is notable, as it is the last thing Glee star Cory Monteith worked on before he died, and it was a definite change in direction for the young star. The story starts on Eugene Wellington McCanick's birthday, a happy day that should mark a reunion with his son, but instead marks a day where he learns that the biggest bust of his career, acquiesced killer Simon Wells (Cory Monteith) had been paroled. McCanick is ordered to leave the situation alone, but he can't rest while this man is on the street and McCanick goes looking for trouble. This is a very dark and methodical drama that really seems to have no depth whatsoever, until you see both sides of the story presented in flashbacks. David Morse stars as your typical tough loner cop, whose life is all about the job. The kind of cop that takes his job personally and will do whatever it takes to bust the people he sees as a threat to his city. When I think tough guy, David Morse is not the first person who comes to mind, but he has a history of playing both the good and the bad guy, making the role of Eugene McCanick perfect for him. He's paired with Cory Monteith, who as a teen heartthrob, has never really been seen as more than a sweet, loveable guy. Simon Wells is anything but sweet an loveable, as he's been severally damaged by a life on the streets, but the question becomes just how bad a guy is he? 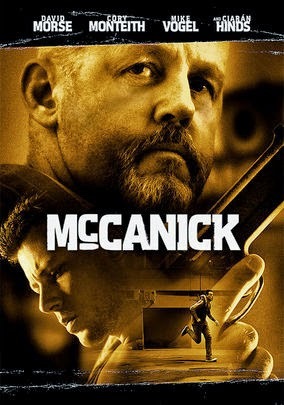 McCanick is the kind of film where everything seems to be laid right out in front of you, the kind of film where you're not expecting a surprise, but that's the whole premise of the film. The whole purpose of the film is to make you question everything you believe and it really turns into to something very unique and special. McCanick doesn't have a cast or a preview that screams out to you, many people are just going to skip it, but if you do, you'll be missing that special kind of movie that leaves you thinking about it long after it's over.